Across developed countries the ownership of companion or livestock animals of various known and exotic breeds has remained high since the last few decades. Developing countries are catching up in this regard as well. Across the world, livestock animals are majorly domesticated for their economic value. Dairy products, meat, fibers, and fertilizers derived from companion animals have considerable market value. In addition, their labor is put to use in agriculture and farming. Besides this, humans have grown fond of petting companion animals. Spurred by these factors the demand for veterinary drugs has increased as veterinarians and owners focus more on ensuring the health and wellness of companion pets. While the market continues reeling under threat from the availability of low quality counterfeit products, the growing affordability of veterinary drugs will keep their demand pacing higher in the coming years. Given the scenario, Transparency Market Research (TMR) forecasts the market to exhibit a CAGR of 5.1% between 2016 and 2024. At this pace, the market which stood at US$17.2 bn in 2015, is forecast to reach US$26.7 bn by the end of 2024. In terms of animal type, the global veterinary drugs market is bifurcated into companion animal and livestock animal. Of these, the livestock animal segment held the largest market share in 2015 on account of the high demand for high quality protein and poultry meat. The companion animal segment will exhibit robust growth as well during the course of the forecast period. The rising pet ownership and the increase in healthcare expenditure on them will boost this segment in the coming years. Based on product, anti-infective, parasiticides, anti-inflammatory, and others comprise the key market segments. Of these, the anti-infective segment held the dominant share in the market in 2015 gaining from the increasing demand for zoonotic diseases. However, between 2016 and 2024, growth witnessed in the parasiticides segment is projected to be higher than other segments. It is forecast to exhibit a CAGR of 6.1% during the forecast period thereby emerging as the most lucrative product segment. The market will witness rising demand for anti-inflammatory drugs as well aimed at improving mobility and quality of life in companion animals. Regionally, North America, Latin America, Europe, Asia Pacific, and the Middle East & Africa constitute the key market segments. Among these, North America emerged dominant in 2015, accounting for value-based share of nearly 31%. It is expected to remain at the fore of the overall market through the course of the report’s forecast period. The region exhibits a higher prevalence of pet ownership as compared to other regions. In the same year, Europe emerged as the second-leading market segment. During the forecast period, Asia Pacific and Latin America is also expected to contribute to revenue generated by the overall market. The increasing incidence of infectious disease among animals will fuel the demand for effective veterinary drugs in Asia Pacific and Latin America. 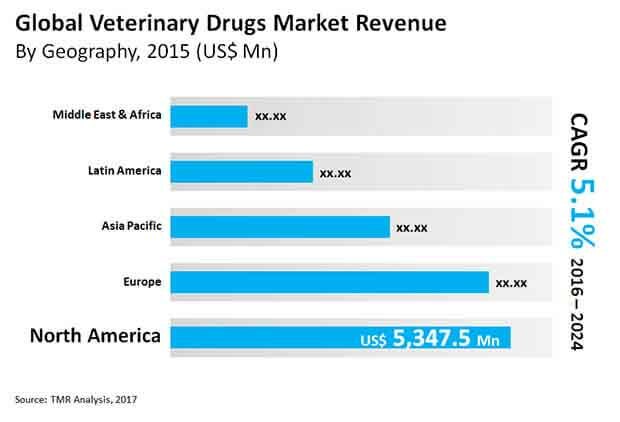 Some of the leading companies operating in the global veterinary drugs market are Zoetis, Inc., which dominated the overall vendor landscape in 2015, Boehringer Ingelheim GmbH, Bayer AG., Elanco Animal Health (Eli Lilly and Company), Ceva Santé Animale, Dechra Pharmaceuticals PLC., Merck & Co., Inc., Virbac, Vetoquinol, and others.